100% Carfax certified, accident free, 1 owner, Lease return, non smoker! EX-L package with heated leather seats, moonroof, room for up to 8 passengers and Honda's legendary reliability and safety record make this one van to put on the short list. In great shape inside and out, we'd love to show you this van! 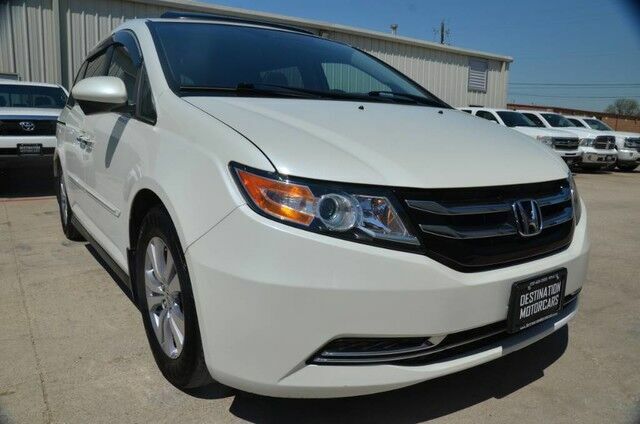 Be sure to visit www.destinationmotorcars.com to view all 66 pictures of this Honda Odyssey EX-L! IMPORTANT NOTE ABOUT OUR PICTURES We truly strive to provide pictures that are accurate examples of the vehicle you are seeing. We go to great lengths to take a large amount of pictures of the inside and outside of the vehicle. A great deal of our customers come from great distances and from all over the country we do our best to make sure the vehicle you see in these pictures is EXACTLY the vehicle you will see in person when you visit or have your vehicle delivered to your home. We do not edit or alter the raw image in any way. If you would like additional details or photos you can certainly reach out to us at your convenience and we will be happy to accommodate you! We aren't like other dealers we strive to create a fun, exciting, no pressure environment we don't have big overhead expenses so we can pass along the savings to you. We study the market and price our cars at a great value upfront to skip the hassle and uncomfortable negotiation process. The price you see is the price you pay! Call us today to see why you'll always want to buy your cars from us from now on! 972-429-3500, call today and lets set a time to meet!